The first edition of Multiple Myeloma: State of the Art was praised for its quality of writing and attention to detail in covering all of the important aspects of multiple myeloma, from pathogenesis to treatment. Creating a worthy follow-up edition was never going to be easy, but Paul G Richardson and Kenneth C Anderson have returned with something even more ambitious. 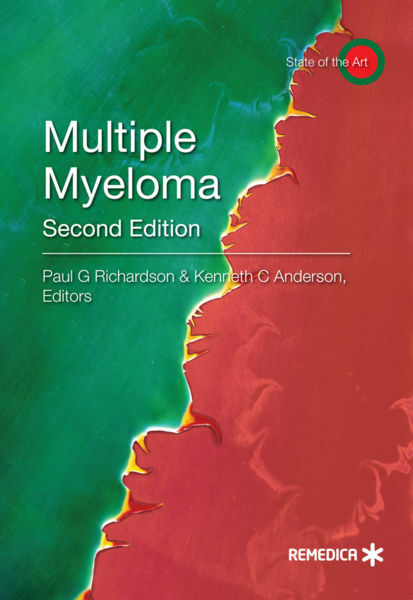 This second edition of Multiple Myeloma: State of the Art is a larger, more comprehensive book that not only updates the first edition but also expands upon it. New sections cover topics including gene expression profiling and cytogenetics, treatment sequencing and tailored therapy, immunotherapy, and myeloma variants. This book provides a practically focused overview of multiple myeloma biology, makes sense of the complexities of its pathogenesis and resistance to treatment, provides a practical take on the large array of new therapies that have been developed, and gives insight into the exciting future of therapeutic opportunities for this deadly illness. Only through greater understanding can improved treatment options become a reality, leading to significant advances in patient outcomes. Art, Multiple, Myeloma, State permalink.